Over the past several weeks we’ve noticed a strong interest from the class to make houses. It began by a group of children drawing houses at the writing table and evolved into children cutting shapes they need to make houses, creating window shutters that flap using tape, and even painting their houses at the easel. We asked families to please email us pictures of the outsides of their houses- any and as many angles as they wanted to share. When we returned from the December break these photographs were printed for children to use to start drafting their plans of how they would want to build a model of their houses. We also had conversations about what an architect does, and we read the book Iggy Peck Architect. The class talked about how an architect builds things, but before they start building they need to draw, or draft, a plan. Children began drafting their plans for building their collage houses. We have been inviting children to work on their drafts at the writing table in small groups. Each child has a piece of easel paper with a photograph of their house glued onto it. Children are encouraged to notice the shapes and details of their house and use a pencil to draw what they notice. They have the option to use rulers if they want to. 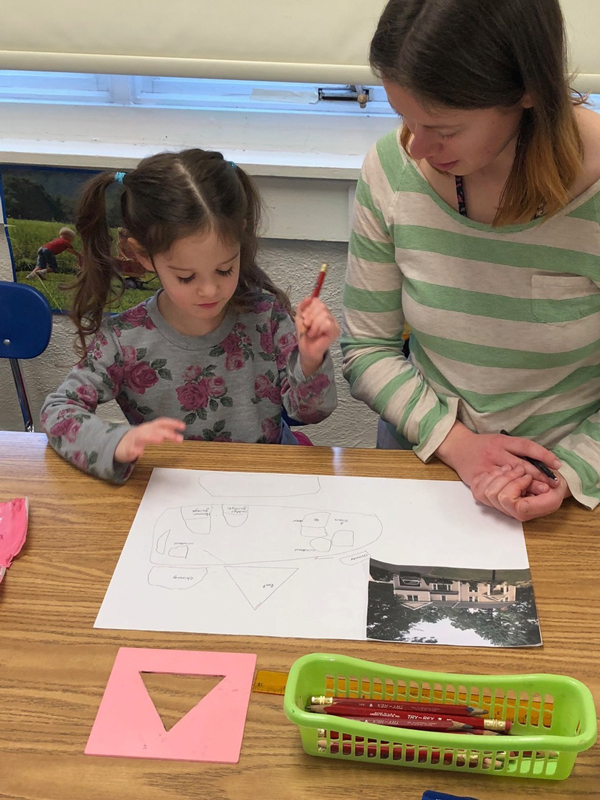 Teachers work closely with the children to label the different parts of the house they want to include in their construction. A variety of recycled materials are featured around the classroom to give the children some ideas about what they might need to build their house. Children are welcome to suggest materials not featured as well, and we do our best to acquire what they need for their big ideas. On each piece of paper teachers are writing a list of materials that the children are hoping to have when they enter the building stage of their projects. We are taking donations of materials that may be used for children’s house ideas. An architect’s draft will be displayed next to a surface with their requested materials so that child can look at their plan while they build. We are also happy to find additional materials for the children if they decide they need to adjust their plan while they’re building. A few weeks ago children began constructing their model houses, based on the draft they created. This is a project that requires many materials and patience, so one child at a time will be working on the building piece. We are reminding the children that everyone will get their turn to build, and we encourage them to visit other children as they build. Children have been practicing making plans with other children in the block area. They use a variety of stories to help them plan what to build, and they also access their block journals to draw up their own plans for their buildings. The class noticed the lined graph paper in the book Iggy Peck Architect and were interested in using it. The writing table now offers graph paper for the children to explore. We introduced blueprint templates. Children worked in teams and independently to create block designs based on the drawn plan. This practice will carry over into the house planning idea we have seen such a strong interest for. Children began making their own blueprints as an extension of what we started. Teachers cut out sponges to match the block shapes that children have been using. At a meeting, children helped to match the sponge shapes to the block shapes by using descriptive words and shape names to identify them. Children then helped choose the colors each shape should be. These shape sponges were then used by children to print their own blueprint designs. Teachers laminated each child’s work and children have used the blocks to build on their own and other classmate’s templates. While children wait for their turn to construct their houses we are offering other building materials. Lincoln Logs have been featured for a couple weeks now, and groups of up to 5 children are sharing the materials. Really interesting designs are being created! This entry was posted in Project and tagged children, curriculum, education, learning, nuthatch, preschool on February 11, 2018 by Katrina Selawsky.